Instrument assisted soft tissue mobilization is when the doctor uses tools to mimic the manual techniques in order to provide an enhanced effect on soft tissues. One common instrument used is a stainless steel tool that slightly resembles boomerang in shape. 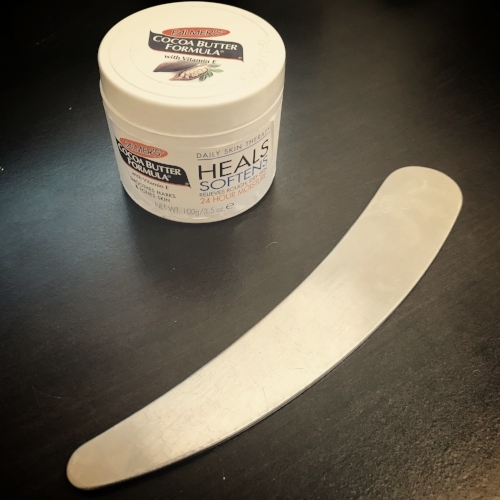 When using instrument assisted soft tissue mobilization, we often use cocoa butter as an emollient to help the tool glide over the skin while treating the fascia and musculature deep to the skin. This tool can be very helpful in releasing scar tissue, adhesions, and fascial restrictions. The goal of the treatment is to enhance healing process. Instrument assisted soft tissue work can do this by breaking down collagen cross-linkages and increasing blood flow to the area.